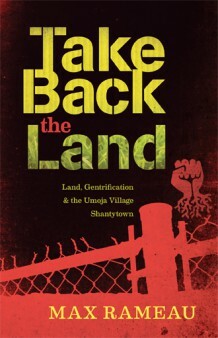 Not going to lie, when I received Take Back the Land: Land, Gentrification & the Umoja Village Shantytown, I was in no hurry to read it. Several prejudices of mine factor into that: the fact the author is advertised as a “Pan-African theorist and campaign strategist” has a lot to do with it. Despite having very little familiarity with Pan-Africanism, I associated it more with National Liberation movements and the unlikely support for Gaddafi which emerged at the time of the NATO invasion than with anything to do with emancipation. And as for the specialization of people in roles such as “campaign strategist”, I am extremely skeptical about what that implies in terms of formal or informal hierarchies: not that people do not have singular experience and skills to contribute, but everyone should be the strategist of their campaign. Then, there is also the fact that it relates the rise of (and fall of, sadly enough, but also lessons to be taken from) a movement about land property and that I have not long ago given up reading Hannah Dobbz’s Nine-Tenths Of The Law, not that it is a bad book in any way, and the chapters I read made me learn about some land struggles I had never read about before, but because of its focus as a guide for American squatters (and its rather exotic view of squatting in Europe), I felt it was not of as much value to me as other books. Now, I think I maybe should give it another go, but when I got Max Rameau’s book, I was afraid it would be the same. Last but not least, the few things I had read about gentrification (texts on the internet, mainly on American anarchist websites) led me to believe it was mainly dumbed-down economics. That is not true of Rameau’s theory at all. Actually, his chapter about “Systemic Issues” is so good that when I started wanted to underlign something to quote it in this review, I just kept on going, and going, as he whole chapter is made of awesome. Sadly, the book does not come with a bibliography, but I will look into this. “Clearly understanding each other’s positions and views is critical to building any coalition. Glossing over differences might be harmless when the campaign around which the coalition is built consists of one simple step. In virtually any other scenario, however, glossing over differences in order to build “unity” in the short term will result in chaos in the long term. Were he to have read them all himself, my guess is that Mr. Dent would have argued that the setting for the “House of Lies” and related stories was the housing crisis, but the theme of the story was not housing, it was public corruption. [They] expressed neither principled nor strategic concern for the public policy of housing, regardless of how bad, so long as no money was stolen during the implementation of those bad policies. The clear priority of the story was to stop public corruption, not necessarily to end the housing crisis. Conversely, the major issue and theme for the political movement was gentrification and the housing crisis, and its impact on the human beings in our community. It was entirely possible, then, that the media would support throwing individual crooks in jail, without pursuing the more fundamental demands of building more housing for poor people. In this scenario, the rich will no longer have their money stolen, but poor people would still have no housing. The rich get a much better deal from this solution than the poor, which is understandable, given that the proposal emanates from huge corporate entities still trying to convince us about the benefits of the real estate “boom”. From a public policy perspective, even if all of the stolen and misspentmoney was returned and then used for the purposes intended by the electorate, there would still be a severe housing shortage in South Florida because the officials voted to create a severe housing crisis in South Florida. “It’s important to be perfectly honest with the people at all times, making clear the risks, and trusting them to make informed decisions about their level of participation. The easy route would be to minimize the risks or pep-talk her into something she was not ready to do, a tempting option given the fact that the issue at hand was much bigger than her and her family. Furthermore, the idea of the county, on the heels of a massive scandal, coming in on television to evict a cancer survivor and her children—who occupy number 31,000 on the wait list—from perfectly good housing that had remained vacant for two years, was almost irresistible. That last quote hints at one of the question this book raises in my mind: what is the precise nature of this relationship between the “organizer” and “the people”. As an anarchist, it is hard not to be suspicious of any kind of relationship or decision-making process as potentially problematic, and a lot of this book has sentences in the elusive style of “the decision was taken” which make alarm-bell rings. By whom? After what debate? Etc. One of the limit of this book is that it is the story of this movement told from the unique perspective of Rameau. This is good for a number of reasons: high coherence of ideas, the gripping impression of living the story through his eyes, more emotional connection. However I was left a bit wishing for his lucid and fascinating testimony to be completed by other perspectives, no doubt mainly reinforcing, but perhaps sometimes hopefully complementing and adding some subtlety to this account. By “other” I mainly mean the thoughts and impressions of the Village residents, who sometimes seem to come as more of an afterthought (quite literally: quote 1) than the centre of the struggle. But reading this book, I now understand why AK Press decided to publish it, and even if Max Rameau is not an anarchist, his work definitely deserves the attention of anarchists for reasons which I hope I’ve shown here, and many more. Go buy it if you can.